It looks a little safer to wade back into stocks Wednesday. But just a little. 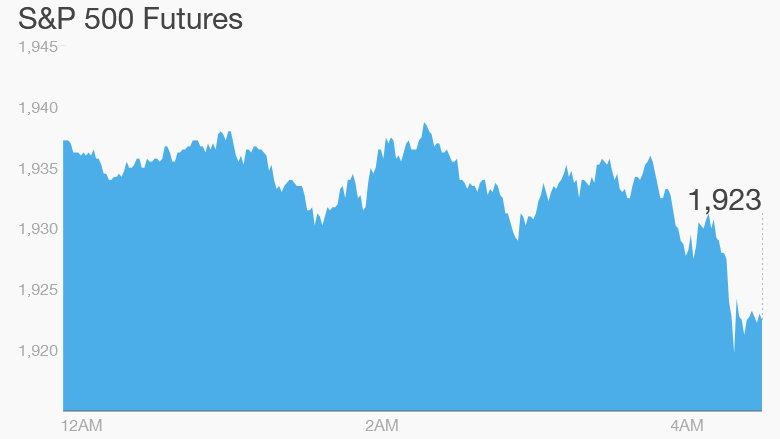 U.S. stock futures are rising though global investors remain cautious as volatility continues to sweep through markets. 1. China swings: It was another day of wild trading in China. The Shanghai Composite index pared sharp early losses to close down 0.2%, while the smaller Shenzhen index lost 2%. Beijing has acted aggressively in recent months to prop up stocks after a crash beginning mid-June wiped out all this year's gains. The market crash, coupled with renewed fears about slowing growth in China, rattled global markets and led to a punishing August for investors. 2. Oil sinks: More pain for oil producers as crude slides 2% to trade below $45 a barrel. Oil has been on a roller coaster ride this week -- surging above $50 a barrel on Monday -- before resuming its slide. Fears about easing global growth and oversupply are still weighing on prices. 3. Earnings & economics: Vera Bradley (VRA) is among a small group of companies reporting earnings today. There's a handful of economic releases to look out for Wednesday, kicking off with ADP August employment numbers at 8:15 a.m. ET. At 8.30am ET, the Bureau of Labor Statistics is due to report revised productivity numbers for last quarter. The Census Bureau will put out new factory order figures for July at 10.30am ET. The newest beige book, which contains information about current economic conditions from regional Federal Reserve banks, will be released at 2 p.m ET. 4. Stock market movers: A few stocks are on the move premarket: Disney (DIS)shares are climbing 2.5% and GM (GM) is pushing up 2%. 5. International markets overview: European markets are drifting lower in early trading, with Germany's DAX index down 0.2% and the U.K.'s FTSE index shedding 0.25%. Shares in Ryanair (RYAAY) bucked the trend in London, rising 2.2%, after the low-cost airline delivered strong passenger numbers for August. Asian markets mostly ended with losses. Japan's Nikkei index dropped 0.4% and Hong Kong's Hang Seng index lost 1.1%. Australian markets shrugged off disappointing second quarter GDP figures to close flat. It follows a bleak session on Wall Street Tuesday. The Dow Jones industrial average shed a whopping 470 points to close 2.8% lower, while the S&P 500 sank 3% and the Nasdaq gave up 2.9%.